Tough loss for ODU and the CAA as I really thought the Monarchs would take this one. In the end Butler beat them at the own game and won the battle on the boards. Sure it was a "mid-on-mid" crime but it was still a great game to watch. And I'm sure we can all agree that if Mason loses like that tomorrow we will all be depressed for days. Even with 06 I still think of 01. Was at both. Perhaps because it was Maryland and some of the words of their fans. Butler did the right things at the wrong times while ODU did the opposite. Like lay ups. any word on the severity of the injuries to Hancock and A Corn? I am assuming they will both play tomorrow, but injuries to ankles are never good. Both are good to go. ODU missed at least two easy dunks. That was the difference in this game. ODU played very poorly in the second half and were very tenative about taking open shots! Not a good game for them. VCU played well against USC and have a good chance of beating Georgetown tommorow. 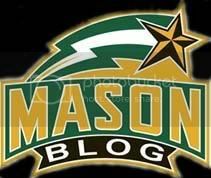 Moreover, if GMU plays to their potential tommorow it could be a double digit win over Villanova. Go Mason!